Synthplex will feature a number of different DIY classes and we will cater to both beginners and experts. 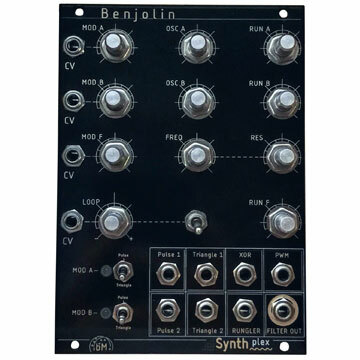 The Benjolin is an original circuit designed by Rob Hordijk. The core of the Benjolin module contains 2 oscillators, one lowpass filter & a circuit designed by Rob himself call the “Rungler”! Each oscillator can be cross-modulated by one another allowing dual cross-modulation between both oscillators allowing for ex treme timbres & sonic exploration. Buck Modular has added a few of their own twists to the circuit, adding the possibility to select your own modulation waveform to be sent to each oscillator with an LED to give you some visual feedback. Outputs include oscillator 1 pulse & triangle out, oscillator 2 pulse & triangle out, PWM output, the “Rungler” output, XOR logic output between the 2 oscillators & finally, the lowpass filter output, which is the mixture between both oscillators running into the filter. Furthermore, the filter can start to sound very wet & this allows for some amazing “drippy sounds” that are not duplicated on other filters. This kit includes; All parts, PCB & custom Synthplex exclusive front panel and full instructions by Skyler King of Buck Modular. The Żłób Modular MiniMix is a simple, low noise, active, 3 channel unity gain, audio or control voltage mixer. Version 2 (2019) adds jumper selectable AC or DC coupling and linear or logarithmic operation for each channel. The newly revised MiniMix is now all through hole and aimed more towards the beginner solderer. 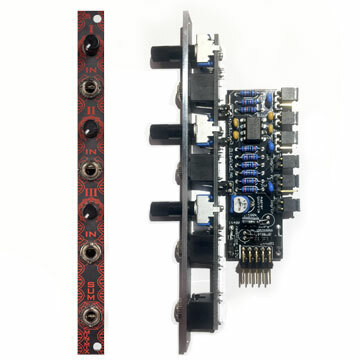 There is also a trimmer on the PCB to increase the master gain up to 2 or more for all 3 channels. Not recommended as a first build, some experience would be helpful but not required. Copyright © 2018 Synthplex LLC. All Rights Reserved.